Show your spectator a deck of playing cards with different backs each with a flag from around the world. Ask your spectator to think of any card remove it from the deck and remember the flag on the back. You then amaze and astonish as you reveal your correct prediction. Know what card they chose every time. This deck is a must have for every magician every skill level. 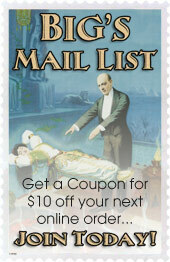 Click the button below to add the Around The World Mind Reading Deck to your wish list.